One of the more common prescriptions in America is for a benzodiazepine. Prescriptions like Ativan, Xanax, and Klonopin are becoming so common that more than 1 in 18 U.S. adults had such a prescription in 2013. While using these substances properly may help a large number of people, the risk of addiction and abuse can be quite high. For this reason, those struggling need a benzo addiction treatment program. Finding a benzo addiction rehab center will help put you on the right track towards long-lasting recovery. Beyond that, abusing benzos can lead to a variety of complications that make this drug much deadlier than most people imagine. Benzodiazepines is a class of drugs that all work to slow down the brain’s natural neural processes. As such, they typically bring on a variety of symptoms like calmness and sedation and may even carry with them amnesic effects. With proper use in the medical field, these drugs help treat conditions like insomnia, anxiety, and panic attacks. Manic and hypomanic episodes in patients with bipolar disorder find relief with these types of drugs. And while they’re particularly effective at treating these disorders, benzodiazepines are highly addictive. As a result, the general consensus among doctors is that benzos should only be prescribed for short-term conditions, especially in cases of individuals over the age of 65. You may, for example, be prescribed a low-dose of Xanax for a month to help you cope with the loss of a spouse or loved one. It is absolutely crucial, then, that you follow your prescribing doctor’s orders exactly. Given that benzodiazepines are some of the most highly abused prescription pills today, becoming physically dependent on them is likely much easier than you think. There are a wide range of benzos on the market today. While they all interact with the brain in a similar fashion by specifically targeting the neurotransmitter GABA, they each have their individual differences as well. Below are the four most common benzodiazepines along with a few identifying facts about each. Xanax (alprazolam) – most prescribed benzo in the U.S. with almost 50 million prescriptions written annually. It’s fast acting, potent, and especially dangerous when used as a substance of abuse. Ativan (lorazepam) – runner up to Xanax as America’s most prescribed benzodiazepine with 28 million prescriptions in 2011, it’s effects are also fast acting but last markedly longer than Xanax. Valium (diazepam) – another popular benzo, Valium is one of the most long-lasting drugs in this class and has one of the longest half-lives in this class (20-50hrs). Librium (chlordiazepoxide) – a long-acting benzodiazepine as well, Librium has an especially delayed peak onset of 2-4hrs and is used to treat anxiety and acute alcohol withdrawal. Klonopin (clonazepam) – primarily an anti-epileptic, Klonopin is an intermediate acting benzo (initial onset at around 15-30 minutes) and stays in your system longer than any other benzodiazepine (half-life of 18-39hrs) besides Valium. Restoril (temazepam) – this benzo is typically used to treat insomnia and other sleep-related disorders. Its peak onset is much shorter than most other benzos and occurs at around 45min to 1½ hours. The primary mechanism of action with benzos is the brain’s neurotransmitter gamma-aminobutyric acid, or simply to GABA. To better understand how drugs like Xanax, Ativan, and Valium affect this chemical, you first have to know a bit about how the brain’s neurons work. On each neuron, there are a number of specialized cells, or receptors, which match up with a specific chemical. When a molecule of that chemical fits into its corresponding receptor, it causes a certain action in the cell. For GABA, that action is to inhibit the electrical activity of the cell and keep it from firing. Benzodiazepines come into the picture by intensifying the effects of GABA, making them even more effective at keeping the brain’s neurons from firing. Consequently, the brain is far more sedated when using benzodiazepines and as a result, is less likely to experience seizures or produce feelings of anxiety and fear. When these drugs are abused over long periods of time, however, the brain reacts by chemically and physically counteracting this strengthened GABA and building a tolerance to benzodiazepines. While the majority of drug overdose coverage has been focused on the opioid epidemic, the truth is that there are a number of very concerning statistics behind drugs like Ativan, Xanax, and other benzos as well. Benzodiazepines involvement in 30% of overdose deaths involving prescription drugs in 2013. The rate of overdose deaths involving benzodiazepines rose by over 400% from 1999 to 2010. Use of benzos from over 5% of US adults in 2008. From 1996 to 2013, the number of people prescribed benzos like Ativan and Xanax increased by 30% with the actual amount of the drugs in a single prescription doubling in the same period. The problem, it seems, is more widespread than most people think. There are a wide variety of both long-term and short-term effects of abusing benzodiazepines. What’s more, the method of abusing alprazolam and other benzos can also impact future health problems. Injection, for instance, can permanently damage veins, cause serious organ damage or stroke, and also carries with it the risk of HIV, hepatitis, or blood poisoning. It seems clear, then, that benzos not only hurt you in the short-term, they can actually cause significant and problematic difficulties in the future as well. Some people may hear about the effects of benzodiazepines and think that these substances are actually the same as barbiturates. sedatives, both highly addictive, and both used to treat disorders like insomnia, anxiety, and seizures. In fact, these drugs are so similar that they even act on the exact same neurotransmitter receptors in the brain, the GABA-A receptors. However, there are a few key differences that distinguish them from one another. Barbiturates, for instance, have a long history of being used to treat various conditions in the medical field. In fact, the first commercially available barbiturate was marketed by Bayer in 1903 under the name Veronal. Benzos, on the other hand, have a bit of a shorter résumé, only first being used in the early 1960s. Having said that, though, these drugs have actually overtaken the more historically used barbiturates in terms of popularity in the medical field. In fact, many physicians consider prescribing barbiturates for conditions like anxiety or insomnia to be long outdated and opt for benzos instead. This shift was due in part to barbiturate use having been found to come with a higher rate of adverse side effects such as liver damage, chronic breathing difficulties, cardiac issues and other conditions related to their toxicity. Do I Need a Benzo Addiction Treatment Program? One of the quickest ways to tell if you have a benzo addiction is by taking a brief online quiz. This will help give you a general idea of whether you actually have a problem or not. From here, you can seek out a benzo addiction treatment program. Another more detailed approach is by taking a look at the behavior patterns of substance abusers as pointed out by the Diagnostic and Statistical Manual of Mental Disorders (DSM-V). If you tally up how many scenarios below that you’ve encountered in a year and it’s two or more, then you may want to seek professional help. You’re more than likely to have a benzodiazepine dependency. You often take either higher amounts of benzos or you take them for longer than you originally intended. You’ve wanted to quit, or maybe have even tried, but simply can’t. You spend a large portion of time trying to get your hands on more benzodiazepines like Ativan, Xanax, of Klonopin. You’ve experienced intense cravings for these substances. You push other obligations to the side because of your benzo abuse. Benzodiazepines are hurting your social or interpersonal life. Activities you used to enjoy take a back seat to abusing benzos. You take benzodiazepines in physically risky scenarios (e.g. driving, traveling, in public). You’ve felt the negative physical and mental effects of using benzos, but you still abuse them anyway. You’re building up a tolerance. You experience withdrawals when it’s been too long since your last benzodiazepine abuse. As with nearly all illicit substances, continuous abuse of and addiction to benzodiazepines comes with the risk of someday overdosing. 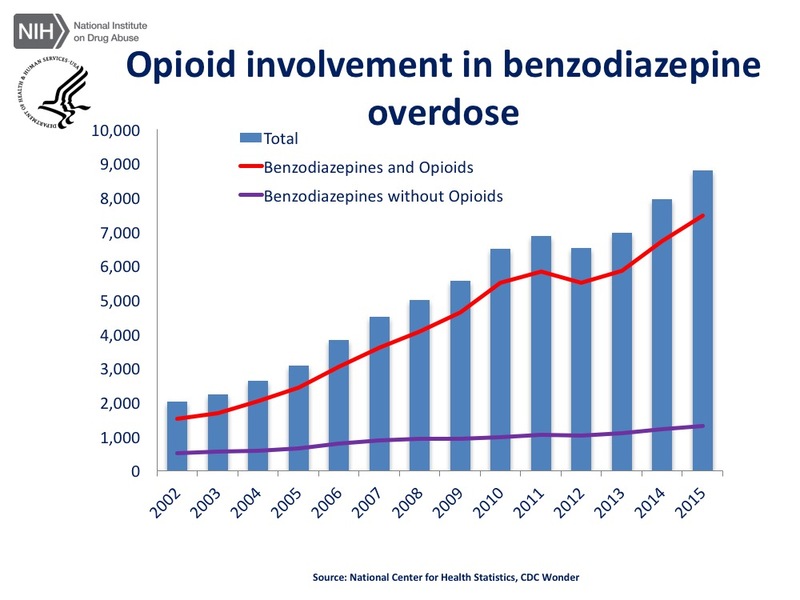 And while some drugs may not carry a fatal overdose risk, a benzo overdose can, in fact, be deadly. As such, it’s crucial to know the signs of overdosing on benzodiazepines so you can get help as soon as possible. In addition to the threat of toxicity from abusing this substance alone, mixing benzodiazepines and alcohol or other central nervous system (CNS) depressants such as opioids increases this risk of overdose substantially. In fact, the National Institute on Drug Abuse reports that the combination of benzos and opioids led to nearly 7 times more deaths in 2015 than with benzodiazepines alone. Using benzos in conjunction with other drugs, then, can be a fatal combination. In her interview with Huffington Post, Dr. Jennifer Leigh described the process of withdrawals from benzos as being especially dreadful. After 18 years of being on Klonopin to deal with her frequent panic attacks, she finally made the decision to taper off of the benzodiazepine. In fact, benzo withdrawals can be so unbearable that they’re widely reported as the most painful and difficult to endure out of any other substance, even beating out drugs like heroin and methadone by an enormous margin. The majority of these symptoms are psychological and tend to be subjective. However, one of the defining characteristics of withdrawal from Klonopin, Ativan, Xanax, and other benzodiazepines is that it lasts for an excruciatingly long time. According to the World Health Organization (WHO), short-acting benzos like Xanax and Restoril can come with withdrawals that are triggered after around 1-2 days after the last dose and the symptoms can last for 2-4 weeks or longer. For longer-acting benzos like Valium, the process can begin about 2-7 days after the last dose but can persist for an astounding 2-8 weeks or longer. Without a professional benzo addiction treatment program, coming off of a benzodiazepine addiction can be life-threatening. You see, as the body builds up a tolerance to lorazepam and other benzos, it’s compensating for a stronger version of the inhibitory neurotransmitter GABA. It does so by reducing the number of receptors and strengthening excitatory neurotransmitters. When you remove benzos from the body during a benzo addiction treatment program, the strength of GABA returns to normal. However, the excitatory systems will experience overstimulation. As a result, your brain is at risk of extreme overactivity that may lead to potentially fatal grand mal seizures as a result. Part of successfully treating a benzo dependency, then, is detoxing under the guidance of a qualified medical professional. They can help put you on a tapering program that not only reduces the severity of the painful benzodiazepine withdrawals, it may also save your life. If you or a loved one is struggling with benzodiazepine addiction, you need help. With the right treatment, it is, in fact, possible to recover and live a clean and sober life. Contact AspenRidge Recovery Fort Collins today at (866) 957-6941 to learn more about our benzo addiction treatment program. Our benzo addiction rehab center will help you with insurance verification, determine the type of treatment you need, and help you reach recovery.